The first person ever to swim Loch Lomond was Gerald Forsberg in 1959 - that must have been quite some feat.. When the BLDSA conceived the notion of a Loch Lomond Championship in 1959, the swim was 'naturally felt to be impossible by the pundits'. After having a solo Windermere under my belt in 2011, I entered 2012 slightly rudderless and not knowing whether I should just have a more of a ‘cruising-around’ type year with nothing silly to over-burden me too much. Rejected that thought quite quickly as that has never really been my style and thought about which challenge could surpass all others in my mind (what could possibly be way beyond my reach?). 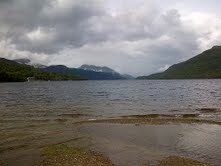 All roads led me to Loch Lomond, the longest swim in the BLDSA calendar. That sent some right old shivers down my spine. On paper, one of the toughest swims of the lot. This was going to be right up my Strasse (although everyone I knew thought I was bonkers). The main aspect that appealed was that only 40 (yes, forty) people up to the start of my swim had ever swum this body of water (since records began in 1959) in a basic swimming costume, goggles & swim cap (no wetsuit). To put this into some kind of perspective, ca. 500 people have flown into space, 3100 climbers have ascended Mount Everest (over 500 in 2012 alone) and over 1000 people have swum The Channel. The exclusivity of this swim made it really precious to me. There were two areas I could never get my head around properly before the swim. One, was the fact that as we were setting off at 3.30pm, I was going to have to swim for 7 hours in daylight then swim through the entire night before landing in the first 30 mins of sunrise. Can't remember reading about that extra challenge in many other swims. My mates attempting the English Channel always seemed to be starting at 2am or 3am. Many have asked why they do this overnight and it goes without saying that conditions are often calmer, there are fewer water users plus no sea planes landing! The other, was that I'd never swum longer than 10.5 miles and 7 hours (Windermere '11). How on earth was my body going cope with that. Was I going to encounter massive bouts of cramp? I noticed that all the other swimmers (bar one who in the end retired) had already ALL swum the English Channel, 2-Way Windermere, Lake Zurich etc. I felt like a real amateur but we all have to start the initiation some time! The first thing I felt I needed to do was to hook up with my old mate Ray Gibbs at Swim Canary Wharf as I’d only had 2 lessons in 2010 since very feebly taking up swimming in 2009 with very much huffing and puffing through 30 lengths once a week. During the winter months of 2012 we had 5 lessons that would build me towards a Swimtrek long distance swim camp in Gozo with complete legend Nick Adams in late March 2012. My immature stroke had led me to rotator pain during the 2011 season and being unable to run (due to multiple knee ops) I was getting very upset as swimming had started to become my new found life-passion that might be cut short. Uncle Ray gradually taught me the merits of the bent-arm catch and I studied front crawl as an art form better than anyone I knew could. He looked at my stroke in slow motion with his cameras and I promised to myself that I was going to have to become the best student that was ever going to grace his tank if I was to be successful in bonnie Scotland. Before going to Gozo, I had heard from the Loch Lomond swim secretary, Janet Wilson, and had the basic reports from the previous 2 swimmers (Vanessa Hammond and Gez Lyon) who had finished in 2010 (out of 6 swimmers who started!). Janet Wilson e-mailed me and stated ‘I hope you find the strength to enter’. I did a whole bunch of soul searching and figured that to complete this swim, I was going to have to cultivate a neat effortless stroke but the other 50% was going to be toughening up mentally. This was reasonably easy given the work I do for the Rainbow Trust who care for terminally ill children and their families – the stuff these individuals had seen and been through was going to be fertile ground for my inspiration. I have 2 beautiful blue-eyed and blonde-haired girls and watching the DVD of poor Josh James struck down with a life-threatening illness rocked me so hard for weeks (and still does) that I knew I needed to do something to help and this was a big mission now. Whenever I hit low points in training (which wasn’t often) I thought of Josh and his family. I therefore started the swim season with my big goal and before I knew it , the first entry form for Loch Lomond had hit Janet’s post box. That was February. Fast forward thru the season….I bumped into Liane Llewellyn and Dee Llewellyn at the H2Open day and they advised that to swim Loch Lomond that the BLDSA events would provide good training. I had decided that this would also provide me with more intensity than just bobbing around Dover Harbour in salty water or down my warm local lake. The longest swim I therefore did (other than the 6-hr at Gozo) before driving to the start line was 7 mile Ullswater which I completed in 4hrs 5 mins but all those BLDSA swims had some intensity about them that I often lack in training. Felt undertrained but please tell me who really feels overtrained for such an event?? 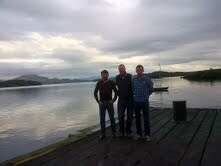 In terms of Crew, I was mad keen to have my mates there who looked after me in Windermere. Long distance swimming can be stressful at times and I needed these lads who could cope with a little bit of the unexpected and are hard as nails mentally and in reasonable shape. Kev was a hero as the mast man on the Sydney-Hobart yacht race in 2005 when he spent 35 hours on a shift on a 40ft boat while most were re-acquainting themselves with their breakfasts/stomachs. And Mick, who is an engineer on the Thames and displays an attention to detail with everything nautical completely unrivalled. He had bought a 12ft rowing boat and repainted each centimetre creating quite a masterpiece - the smartest rowing boat ever to grace Loch Lomond. These 2 guys never let me down. (Do not approach the following men on your own if you come across them in the street - they are dangerous.....Mick on the left who goes weak at the knees for Scotch pies and eats them for every meal in Scotland. Kev on the right who is partial to a wagon wheel or two and either refers to you as a 'Dude' or a 'Squirrel'...you don't want to be the 'Squirrel'. Couple of right rascals). When we turned up at Luss we bumped into some locals during the first few hours....'Yell neer doo it, the'll fiesh yer oot like they did this wee laddie off Inchmurrin. Ye'll neer swim this Loch'!! We heard this repeatedly from the wonderfully optimistic locals....how ideal......gave me some nice mental fodder to want to prove them wrong!!! I have added a very basic map to help with the rest of the narrative! So, there it was, on Saturday the 25th that we turned up an hour ahead of our start time and got ready for the briefing with a start time (alongside another swimmer – Jo Norton Barker) of 3.30pm. The lads rowed the boat over from the pontoon of Ardlui to the ‘beach’ where the start was to be and I walked around and bumped into probably the nicest person you would want to bump into when you are suffering from nerves, Gwyn Llewellyn, one of the cheeriest men I have ever had the pleasure of meeting. His lovely soft and calming welsh accent made me feel at ease and now comfortable I was now around my swimming fraternity again. After a kit check, where we had at least 2 of everything (apart from the swimmer of course), the whistle was then blown and we set off alongside Jo & her team. I entered the water and the Sheridan body thermometer reckoned it was ca. 14 or 15 degrees but you never quite knew what temperatures were about to approach you further down the Loch. I had trained in Wastwater only 2 weeks prior in 10-11 degrees so this felt absolutely fine (in fact never once felt cold). We took it steady in that first stretch of water and benefited from a cheeky northerly wind that slowly pushed us passed Island I Vow which was beautiful. I reassured myself that we were flying along and the new chilled out stroke felt effortless and I was beginning to find a rhythm. We gradually passed the power station at Inveruglas (visible in the background in picture below) and the water then was like a sheet of glass. Completely still – it was like swimming through finest silk – it was absolutely lovely. I don't mind admitting to you that I really struggle with my faith but all of a sudden felt I was getting recompense for spending many Sundays in our local village Church and a higher being was looking after us. Over the mountain above the power station the late afternoon sun was reflecting pink against the clouds being formed on the mountain and Kevin looked so positively moved by such beautiful scenery. If there was a magical moment I will never forget this was it. We proceeded to take the most direct route as the weather was on our side and passed Rob Roy’s cave which conveniently said 'CAVE' on a rock! As soon as we were parallel with Tarbet, all of a sudden a bit of a wind was churning up the water and making head way difficult now with a wind that was coming from the south west (a marked contrast from the previous northerly). To make life easier I made for the eastern shore and found good shelter all the way until we crossed the Loch just after Firkin Point (which the lads had a new name for as ‘What’s the Firkin Point?!’). We then went past Rubha Mor (which the lads called Ruby Murray) and darkness had now completely set in....The full moon never snuck through the clouds and it was pitch black. It must have been around 11pm and the next few hours were a bit of a slog down to Luss. We had the lights of Inverbeg caravan park that never seemed to get closer and the crew were desperately seeking the navigation buoy that was supposed to be working by flashing a red light at us. Well, it wasn’t, and before you knew it the lads were within 1 meter of it and the next thing was that they were aground!!! Kev got out and pushed them off (much to his disgust) and we carried on looking out for more navigational lights that didn’t also appear to be working (the Rangers assured us the day before that they were). We FINALLY went passed Luss which was hard as our cabin was there with warm beds and a warm shower. It would have been easy to get out but I was conscious my mind might play that game on me...... We ploughed on......the lads were navigating during these dark times solely by the compass bearings they had super diligently taken the day before. It was really professional stuff from Mick utilising the diligent markings he'd made on the Navigation map. Finally took a sharp right between the last western island and the mainland and I saved my energy as I know that the final 5 miles were going to be tough. At the end of this Island called Inchtavannach we knew from looking at the Loch that we were going to have to make a small left turn back out to the main body of water and passed the golf course. We think we saw Alister Stocks struggling in that bay as the wind was suddenly south-easterly across the whole loch with no island to shelter it and after the flat calm of the island was suddenly harder work. Kev thought that we flew across to Rossdhu House were the water was very shallow and I was keen that the crew weren’t going to run aground again! We benefited here from the crew having a day on the Loch the day before - I am sure of that. We then saw Inchmurrin Island and the lights of Balloch and Dumbarton in the distance. The horseshoe-shaped bay opposite Inchmurrin felt like it was going on forever and I was getting delusional thinking that we weren’t moving forward. My eyes were now swollen from my goggles and each light was magnified looking like stars which made my personal navigation hard. It was at this time that I think I started to begin to understand the meaning of the word ‘endure’!! The last few miles were tough and we finally headed for Duck Bay where Mick could make out orange lights and this was going to be close to the finish. FINALLY, darkness left us and the world of bonnie (or gloomy) Scotland started to get light. The street-lights went out and out of the murkiness we were starting to get our bearings again gradually. I was still very overcome during the certificate presentation and especially so when Alister Stocks, after his certificate presentation, got down on one knee to propose to his girlfriend. Picture the scene - Alister after the rough end of a 17 hour swim in tracksuit & hoodie with a Robie over the top looking liked he'd aged during the swim by 15 years presenting the ring to a very glamorous lady in a pink jacket with the romanticism of the finest Italian. Who said us Brits aren't romantic??? I couldn't hear it but apparently Dawn said 'Yes'.....Hooray for the happy couple! Honoured to be present to witness that. Well done Al. This had been a long old journey from the start of training to this point. I had done a week in Gozo, swum lake Bala 3 times in 2 days, the Champion of Champions 9-miler, Ullswater 7-miler, Wykeham Lake in Scarborough, finished the Torbay swim in gale force winds and now I had raised over £7k again for my mates at the Rainbow Trust (http://uk.virginmoneygiving.com/MarkSwimsLochLomond). No wonder my eldest daughter wouldn't let me go for 3 hours when I got home - they hadn't seen that much of me..... I really felt right then that I had just transformed my life. I had become one of only 47 people lucky enough to say that they had conquered the Loch and had the certificate to prove it. My finishing time was 14 hours and 44 mins. Taking 3rd in the Gentlemen's category...Apart from being chuffed to finish, I was secretly pleased with the finishing time after putting 16-17 hours on my entry form. Must have really improved as the season went on. Nothing great is easy (in the words of Captain Webb)…..that may well be true….AND nothing great has to be impossible either. There aren’t words in English that describe how contented deep down I am with myself for doing this…'amazing' or 'incredible' don't come close...... Not bad from that plucky little lad from Woolwich who could only swim 30 lengths in 2009 had put his name alongside some real greats who had graced this body of water. What an supreme honour. This glow gonna last a lifetime. I hope my story will give others the belief that they can do it. I am only too happy to encourage others..... Here are 12 bits of advice I’d pass on…..
Do not underestimate the need for the right crew, boat and navigation. My crew had a day on the Loch in daylight but the whole game changes at night. I can give you 2 instances at least where swimmers could have saved 1 hour EACH. Go there in daylight and in the night. Buy the navigation map from the Balloch slipway rangers. That’s the best £12 you’ll spend in your life. I owe Kev and Mick big time. They were rock stars of the highest order. I fed every ½ hour and started after ½ hour. I had mainly warm Summer Fruits & Maxim for the first two thirds, then hot chocolate for the final third. I used up 7 litres of hot water in total. I used the pump-action thermoses recommended by Nick Adams – they were ideal. I had also the odd gel, Mrs Sheridan’s boiled home-grown new potatoes (when I wanted something non-sugary), fun-sized mars bars and bananas. All settled well and would do the same again. The feeds came around quickly and the swim never really dragged. Swim feed-to feed. Don’t get ahead of yourself and don't overstress about the body of water. it's just an extension of a pool or a small lake where you might train. Try and stay in (and enjoy!) 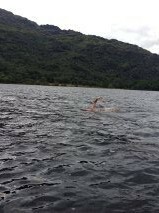 the moment (you are only in this stunning location for a short time) - swim bay to bay and tree to tree and keep 'bigging yourself up' .... very few people will get a sight of the Loch the way you will as a swimmer with such stunning mountains. Get a good boat. Mick’s was perfect. It could keep up with a swimmer as it was thin but was also heavy so wasn’t going to get blown around all over the place. Make sure you wear Crocs at the beach end. The rocks are sharp. Don’t try and stand up and be a hero. Just relax and crawl up the beach if you have to! 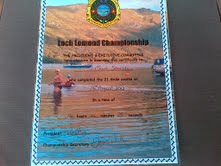 To qualify for Loch Lomond, you have to show proof of 8 miles in open water in the prior 24 months. I was arguably under-trained but I think my training was about right. I spent many hours in colder water (Wastwater, Buttermere, Crummock) but never submitted myself to 2x 6 hours back to back mullering..... As soon as I got into the water there was no shock. 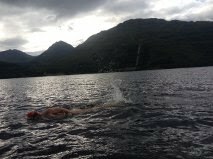 The longest freshwater lake swim I did before in 2012 was Ullswater 1-way (7 miles). 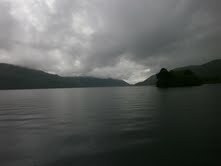 Ullswater was way colder and was ideal prep. My advice is to have a good efficient painless stroke rather than mullering yourself with 100 miles per week. That’s my take on it but others might say differently. Be organised. The preparation that you put into this will make the D-Day landings look like a spur-of-the-moment decision. 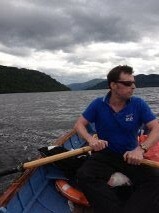 We had to tow our own boat, outboards, petrol, kit, you-name-it from Sevenoaks to Loch Lomond. I would do it again knowing that we had all the kit. No stone was left unturned and nothing left to chance. I could easily see how the best swimmer in the world would never finish this without the skills of his boat crew. Finally, and pinching some advice off Andy Wright – Get there a few days early, leave the crew to their business of plotting navigation etc and ‘just bloody chill out’. I spent a day on the bonnie banks eating, reading and listening to tunes. Glad I had a whole day to recover from that drive. I therefore started the swim refreshed and raring to go. That was really great advice from Andy. Massive respect - well done.